“I give to Sacred Heart, and will continue to do so, because the School is a place for women to grow to be independent, while still being cared for and nourished. Sacred Heart, to me, means a place where learning is all encompassing, and gives girls the tools to change the world.” -- Lizzy Considine ’16 (Georgetown University ’20). The 2018 – 2019 Fund for Sacred Heart runs July 1, 2018 – June 30, 2019. The goal is $1,800,000, which will be reached through the collective support of parents, alumnae, faculty/staff and friends. A successful fundraising effort requires the support of its community. Below you will see your Fund for Sacred Heart dollars at work. Q. What is The Fund for Sacred Heart and why do we need it? 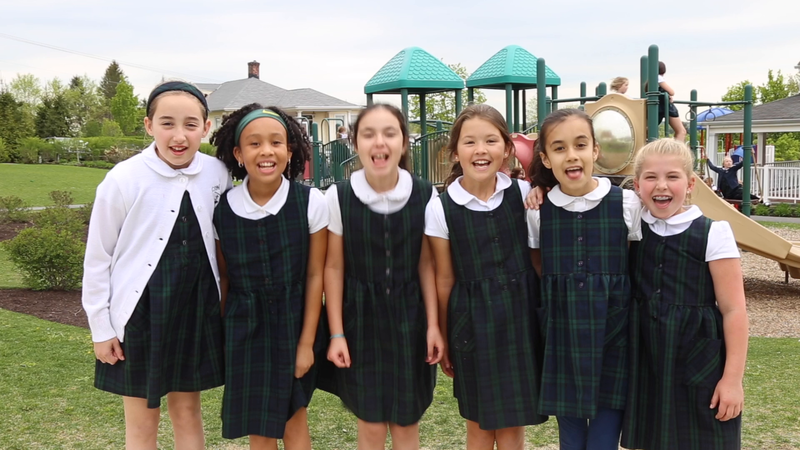 The Fund for Sacred Heart sustains Sacred Heart’s commitment to quality education. As with all independent schools, Sacred Heart’s tuition does not cover the entire cost of educating each student. We rely on annual giving from current and past parents, alumnae, trustees, faculty and staff, grandparents, and friends to help close the gap ($5,000) between tuition revenue and the full cost of providing our superior program. Q. Why doesn’t Sacred Heart raise tuition to pay for all of the operating needs? Although Sacred Heart must raise tuition annually to guarantee growth in faculty salaries and educational programs, the School could not charge the full cost without seriously limiting the number of qualified students who could afford to attend. Augmenting tuition with The Fund for Sacred Heart also enables the School to keep tuition at a competitive rate with the surrounding community. In addition, a gift to the The Fund for Sacred Heart is tax-deductible as allowed by law; tuition is not. Q. How are The Fund for Sacred Heart dollars spent? Gifts to The Fund for Sacred Heart provide unrestricted support for the operation of Sacred Heart including program and classroom materials, student activities and clubs, athletic programs, financial aid, and maintenance of the buildings and grounds. Q. Who determines The Fund for Sacred Heart goal? If we don't meet the goal, will the School be affected? Working together, the Administration, Finance Committee, Board of Trustees and the Advancement Committee determine The Fund for Sacred Heart goal. The process is a balancing act of tuition revenue forecasting, maximizing the Fund for Sacred Heart's potential, and an acknowledgement of the importance of the continued health and strength of our School. If we don’t meet the goal, the deficit would have an across-the-board impact, with potential cutbacks being shared by all divisions. Q. Who should give to The Fund for Sacred Heart? EVERYONE who is a part of the Sacred Heart community. Contributions to The Fund for Sacred Heart cover a wide range, from the $5 or $10 a young alumna in college might send to many thousands of dollars. Q. What is the Barat Society and what are the giving levels? The St. Madeleine Sophie Barat Leadership Society recognizes those who contribute $5,000 or more each year to The Fund for Sacred Heart, endowment or designated funds. Members will be invited to a Society Reception. Q. I can’t make a big gift. Does my support still matter? Yes. We need and value every family’s support in every way. Your gift, regardless of the amount, will provide additional resources and will often serve to encourage others to make gifts. Everyone who is solicited is asked to give generously. An appropriate gift is one in proportion to your ability to give. Corporate matching gifts enable donors to increase the value of their gifts and provide a valuable source of revenue for the School. Q. Why is percentage of participation important? High participation in The Fund for Sacred Heart is an important way for us to demonstrate to others in our community and to prospective families the commitment and dedication of our parents, alumnae and friends to the School and our students. We aim for 100% participation. Foundations and corporations awarding grants to an educational institution often look at the level of parent, alumnae and community participation in The Fund for Sacred Heart. Q. Does it matter when I pledge or make a gift? A gift or pledge made early in the school year is a great advantage to the School because we will know how much money will be available to support the budget. To help plan our spending, we ask that donors please make pledges by December 31, if at all possible. Pledge payments and gifts can be made through the end of the fiscal year on June 30. Once you have made your Fund for Sacred Heart gift or pledge, you will not receive another solicitation until the next academic year. Q. How do I contribute to The Fund for Sacred Heart? Please visit Ways to Give. Q. Whom do I contact for more information? Deborah Doornick, Director of The Fund for Sacred Heart, at 203.532.3572 or doornickd@cshct.org.